Do you always park you car in No-parking zone ! Do you have this habbit of keeping car outside the malls in scorching sun while you shop inside the centrally air conditioned mall ! And always thought no one would tow away your car ! Well, there is a bad news for you ! Delhi traffic police has found a new way to punish and fine No-Parking offenders. Till now the cars parked in no-parking zones were towed away by cranes, but often it was time and energy consuming task, especially in crowded areas such as chandni chowk, karol bagh, rajouri garden etc. Towing cars in such areas was a herculian task in itself. But now DTP has acquired Wheel Clamps. 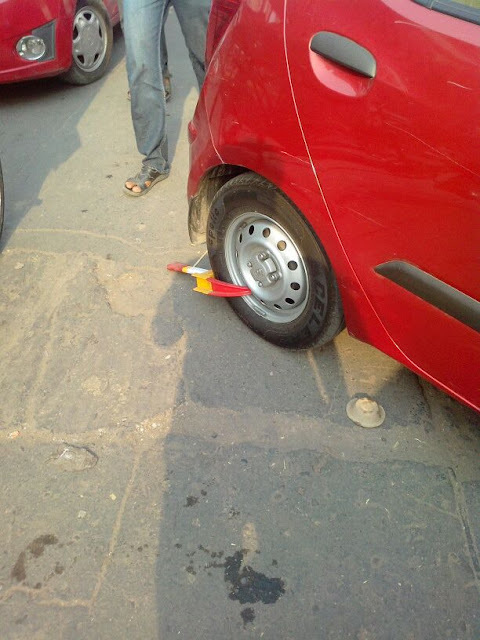 Delhi traffic police has been spotted using such wheel clamps on vehicles parked in no-parking zone. The image above is sent to us by our avid reader Ujjwal Gupta. He further mentions, there is a Mobile number Mentioned on every clamp, so that the owner can call at the number ask cops to remove the wheel clamp as they pay their due fine. Innovative, isn't ! PS: These clamps are made for wheels up to 14-15 inches… so if your vehicle has bigger wheels, you are saved.